Over the course of their academic careers at The Cooper Union, students often take involved roles in ongoing research on campus—whether under terms of tutelage and collaboration with faculty or on their own independent projects. Various fellowships and research opportunities provide support, resources and visibility to original student work, some of which are outlined in greater detail below. The Benjamin Menschel Fellowship Program to Support Creative Inquiry was endowed by a grant given to The Cooper Union by the Horace W. Goldsmith Foundation in 1994 to support work in the fields of art, architecture, design and engineering. This generous grant was intended to provide funding to exceptional students who propose scholarly, independent projects that will in some way provide a culmination to their educational endeavors at The Cooper Union. It is the hope of the Goldsmith Foundation that the students designated as Benjamin Menschel Fellows will be encouraged by their awards to complete bodies of artwork, develop scientific protocols, or otherwise further their intellectual investigations in a manner that will provide inspiration and illumination to the community as a whole. The Cooper Union Internal Grant Program for faculty, staff, and students provides funding for projects that enhance our students’ learning experiences; our faculty’s teaching, scholarship, and practice; new ideas for our future; and opportunities for our community to come together in addressing the critical societal issues of our time. The C.V. Starr Research Foundation, formally situated within the Albert Nerken School of Engineering, regularly provides financial support to senior-level engineering undergraduates in pursuit of their final research projects. The Rhoda Lubalin Senior Fellowship The Rhoda Lubalin Fellowship is awarded annually to a selected rising senior student, (or current senior graduating in December), within the Cooper Union School of Art who has excelled in the field of graphic design. Endowed in 1987 by Mrs. Rhoda Lubalin in honor of her husband, Herb Lubalin, the Fellowship includes a stipend to execute a project that will make a lasting commitment to the Herb Lubalin Study Center. Travel Fellowships offer enrolled students to study abroad at peer institutions and oftentimes conduct personal research and projects. The Schools of Art and Architecture offer the Palmer Hayden Travel Fellowship for African-American students. 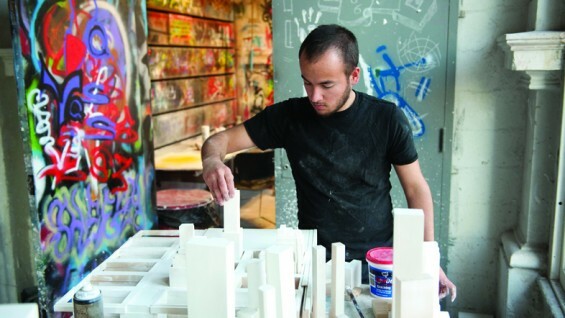 The School of Art also offers the Martin Rothenberg Travel Fellowship and others.